Harper has fall pictures today so I made a simple skirt for her to wear. Nothing fancy, just comfy and practical. I made a yoga style waist. I also made a matching headband, but she thought it made her hair look funny. She told me that she liked it, but thought other people might think she looks funny. I think she was trying to be nice. Sorry about the focus on this one, but wanted to show the waistband. Don't you love the necklace? It totally makes the outfit, right? Also for the record I did not dress Miller this morning. There are some battles I choose not to fight. Dressing is one of them. I also made myself a headband using the fabric, but of course did not take a picture. I love all the colors in the fabric. It will match a bunch of stuff. I finally listed some GreenCraft magazines along with the cozies that were featured in the magazine in my Etsy shop. 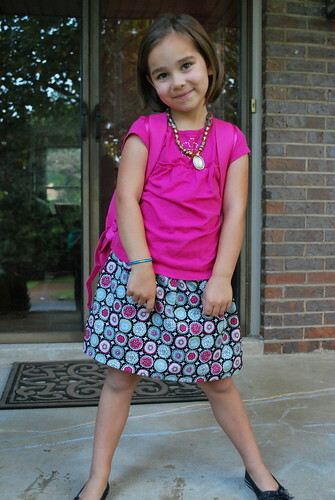 Wow, she has a great sense of fashion at such a young age. Simply adorable. You did a great job on the skirt! Love that skirt! It looks so comfy with the yoga waist, and it's a great fabric for it. LOL about Miller's outfit. Really, it isn't bad AT ALL. You should see what Kai looks like some mornings. If he halfway matches I don't say anything but sometimes I just can't let him out of the house in some of his outfits. cuuute! i like the yoga waist, too! that is so much better than the elastic! where did you get the cool print fabric? i love that she was trying to be diplomatic about the headband! Too darling that she tried to spare your feelings like that! What a sweetie. 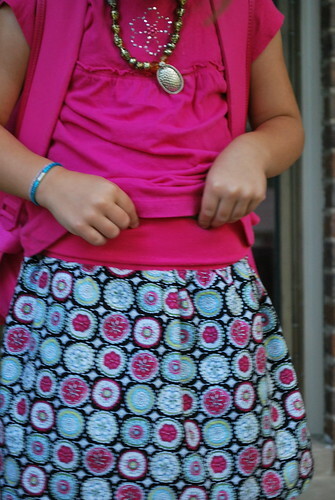 And what a sweet skirt, love the yoga waistband! very cute skirt! too funny about her putting the blame on others about the headband--so sweet!